On the north side of Akron, Ohio, inside the cafeteria of crumbling Firestone High School, Theresa Magee sits impassively at a small table. The infectious “Watch Me (Whip/Nae Nae)” bounces off the drab tile walls, but she doesn’t move. The aroma of sweet barbecue wafts through the air, but she doesn’t eat. Magee, a mother of six and grandmother of 13, is about her business tonight. She’s checking on LeBron James’ promise. LeBron is not in the building — his Cavaliers are headed to Detroit this January night to beat the Pistons — yet his presence looms large. Arena-sized cutouts of his face lean against chairs on a stage. Two practice-worn pairs of his size 15 Nikes rest among a table full of gifts. His initials adorn rubber bracelets worn by many of the 200 children, parents and educators gathered here by the LeBron James Family Foundation. Tonight’s session is one small piece of James’ multiyear effort to help the city’s most academically challenged students qualify for a free college education. One month later, he rebranded his Wheels for Education charitable program — which had grown from 250 to 1,000 kids, and from offering free bikes to free college — with the additional name I PROMISE. Keeping that promise may be even more difficult than breaking Cleveland’s championship drought, which extends back to 1964 when the Browns finished atop the pre-Super Bowl NFL. He’s promising to push kids — some of whom can hardly read — all the way to college, to defeat a societal problem more devastating than any Steph Curry jump shot. Can James keep his promise to Akron? 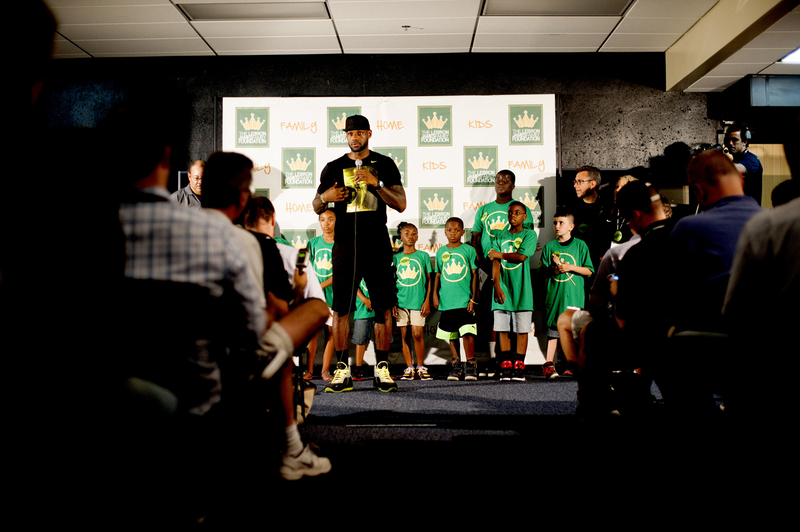 LeBron James speaks during a press conference at The University of Akron before the kickoff of his welcome ceremony at InfoCison Stadium at The University of Akron on August 8, 2014 in Akron, Ohio. Magee’s family may hold the answer. Her daughter Krystle, 32, who never finished high school, is taking free GED classes paid for by James’ foundation. Krystle’s 10-year-old daughter, Arieonna Maxwell, is in the Wheels for Education/I PROMISE program, which is reserved for kids with low reading scores. The children receive a constant stream of recorded phone calls, letters and website messages from James; after-school tutoring; and trips to places such as the symphony, a TV station, a toy design firm, an amusement park, and Cavs games. College is still a long way off for Arieonna, who is finishing fourth grade. And the Akron school system has significant problems of its own. Its after-school tutoring sessions — the primary academic component of James’ program — lost a $1 million state grant in September 2015, a third of its annual budget. The city’s four-year graduation rate is 74 percent, which earned a grade of F from the Ohio Department of Education. “I promise,” the children say in unison, “to go to school, to do all my homework, to listen to my teachers, because they will help me learn. “To ask questions, and to find answers. To never give up, no matter what. “To always try my best, to be helpful and respectful to others, to live a healthy life by eating right and being active. “To make good choices for myself. To have fun. Forty miles south of Cleveland, Akron is a city of almost 200,000 residents, 32 percent black and 62 percent white. Rubber and tire companies — Goodrich, Firestone, Goodyear — brought prosperity until the 1970s, when the decline of American manufacturing reduced it to another notch in the blighted Rust Belt. 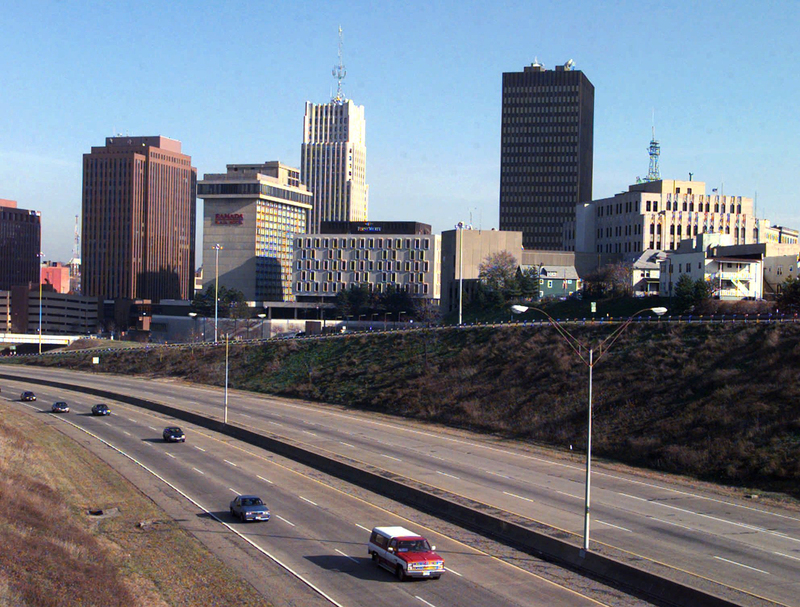 Today, 27 percent of Akron residents live in poverty. In several black neighborhoods, infant mortality is double the national rate. Poor children are overrepresented in the public schools, with 86 percent of students qualifying for free or reduced-price lunch. Born to a 16-year-old single mother, James moved from apartment to apartment and couch to couch as a young boy. In the fourth grade, he missed almost 100 days of school. That’s when Frankie and Pam Walker embraced him, providing an attention and discipline that changed his life. Frankie Walker, who knew James from the youth football league he ran, worked at the Akron Metropolitan Housing Authority. Pam Walker worked for a local congressman. In their three-bedroom home in a middle-class neighborhood, James shared a room with one of their three children and was absorbed into the family’s emphasis on school, chores, sports, homework, punctuality and responsibility — the kind of values James’ kids recite in their promise. “Black men got to help black men be black men,” Walker stated. 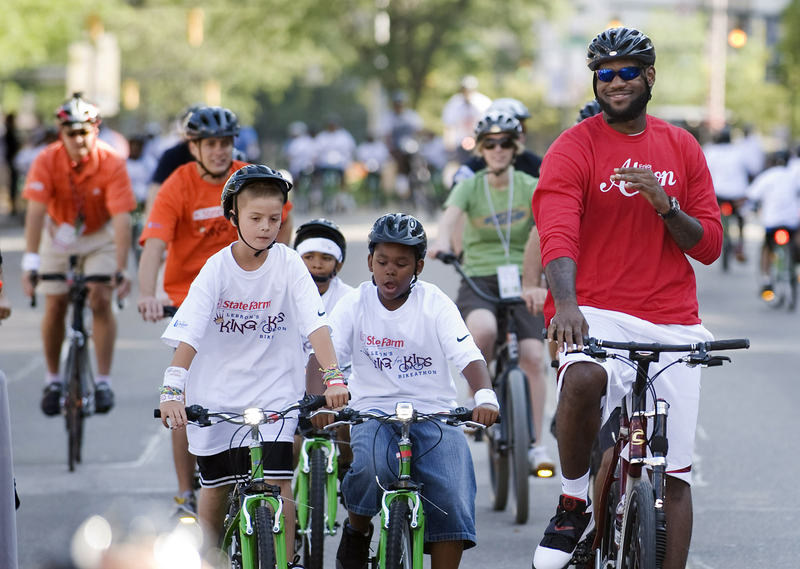 AP Photo/Phil Long LeBron James, right, finishes his ride during the LeBron James Family Foundation, King for Kids Bike-a-thon, in Akron, Ohio, Saturday, Aug. 7, 2010. After the Walkers enrolled James at Portage Path Elementary, he didn’t miss a day of fifth grade. Other coaches and mentors helped him as well. His mother got back on her feet and found a stable apartment for herself and her only child. James graduated from a Catholic high school, St. Vincent-St. Mary, as the most hyped schoolboy basketball player ever. After he jumped from high school to the Cavaliers as the No. 1 draft pick, Pam Walker told him that he was obligated to give back. James earned $65 million in 2015, making him one of the highest-paid people in professional sports, according to Forbes. The LeBron James Family Foundation’s biggest expenditure in 2013, the most recent year for which tax forms are available, was $903,170 for Wheels for Education. Another $358,333 went to St. Vincent-St. Mary, and $171,443 was given to various other organizations, including James’ Akron-based AAU basketball program, the local school district, and a memorial fund established after the 2012 Newtown, Conn., school shooting. The foundation’s biggest single donation over the past six years was $2 million to the Boys and Girls Clubs of America in 2010. That was James’ share of the proceeds from ad sales during his disastrous televised “Decision,” when he announced his departure for Miami live on ESPN. Other athletes have made more dramatic donations. Golden State Warrior forward Draymond Green recently gave $3 million to Michigan State, his alma mater, for example, and hockey star P.K. Subban of the Montreal Canadiens pledged $10 million to a Montreal children’s hospital. It’s the focus on small-town Akron that distinguishes James’ philanthropy. The city helped one kid who became a global superstar. Now this superstar — who never attended college himself — is trying to encourage, cajole, educate and uplift a thousand hometown kids. “It’s tough to get out of the bed in the morning when it’s cold and dark,” James wrote to his kids in January. “Sometimes, all I want to do is stay in bed and watch cartoons, so I know how it feels. No matter what, we have to get out of bed and go to work. Understood? What is the value of James’ college promise? Officials at his foundation say they plan to keep adopting third-graders and send at least 2,300 kids to the University of Akron. Tuition and fees at UA, which has 21,000 undergraduates, currently total $10,977 per year. That’s a potential total sticker price of almost $101 million in today’s dollars. But James is not promising to personally pay this huge sum. Almost all his students are from low-income families and will qualify for federal aid. To make up the difference, the university will raise money and use its normal financial aid, said UA president Scott Scarborough. Locals say that kind of calculation misses the point, anyway. Even though he’s one of the best athletes in the world, a one-name celebrity, they’re thrilled he’s present, here in unpretentious Akron, in ways both large and small. That’s delivering on a different piece of his promise — to care, to remember, to lead. 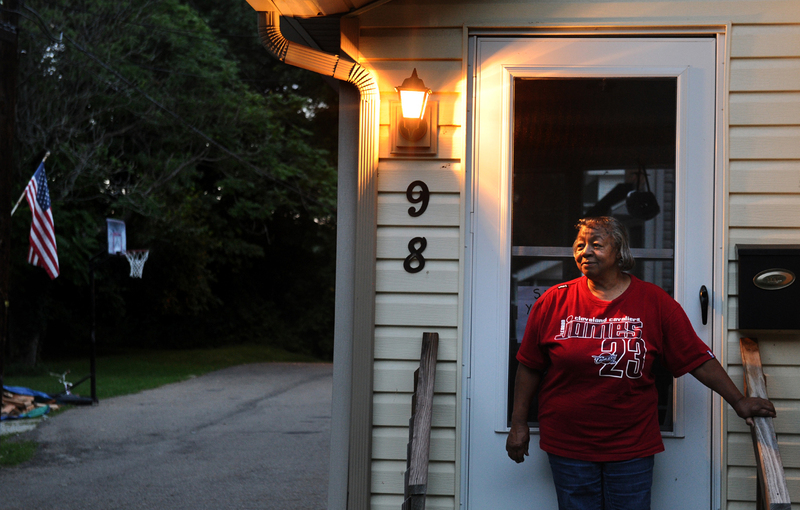 Photo by Wally Skalij/Los Angeles Times via Getty ImagesWanda Reaves, who once housed LeBron James as a child, stands at her front door on Overlook Place in Akron, Ohio. Over at the Regal Theater, two young women behind the concession stand recall James bringing his two sons (he also has a baby daughter) to see “Minions” last summer, waiting in line for snacks like any other customer. The next week, he returned to host the world premiere of “Trainwreck,” in which he co-starred. Or on the sidelines of a St. Vincent-St. Mary football game, hollering at players from the sideline like an assistant coach. Or at a Swenson’s burger drive-thru, ordering the Galley Boy and a banana shake. Or at a particular chain restaurant in Akron, where James and his family ate breakfast the morning after the Cavs beat the Warriors, in Oakland, Calif., in Game 2 of the 2015 NBA Finals. “People don’t bother him because it’s not uncommon. He comes in here four or five times a year,” the manager said. He asked that he and the restaurant not be identified, to preserve James’ tranquility. This protective impulse demonstrates the two-way nature of the relationship between James and Akron. It seems to nourish both — especially after he was vilified for signing with Miami. In April 2012, the year after James went to the Heat, he moved his business office from Cleveland to an unremarkable, three-story office building on the west side of Akron that also houses medical, legal and financial offices. James’ home is in neighboring Bath Township, 30,000 feet on seven fenced-in acres, which he never sold after the Miami move. The importance of those connections came out on the podium after he won his second NBA championship with Miami in 2013, when James was asked how he deals with all the scrutiny. “I can’t worry about what everybody say about me. I’m LeBron James from Akron, Ohio, from the inner city. I’m not even supposed to be here. That’s enough,” he replied. Ask people here how they felt when James took his talents to South Beach in Miami, and those from outside of Akron often use the word “betrayed.” People in Akron, especially those who came up rough like James, don’t deny their disappointment. But they say they understood. While in Miami, James spent $1 million to renovate the St. Vincent-St. Mary high school gym he had played in, selecting NBA-caliber whirlpools and the proper ice machine himself. There’s a permanent locker in the training room for his workout gear. Some people urge him to address issues such as gun violence or the police killing of 12-year-old Tamir Rice in Cleveland. James’ attention remains focused on Akron. The fate of James’ college promise largely rests with the Akron Public Schools. “LeBron cannot do it himself, and that’s the beauty of the whole thing,” said the district superintendent, David James. He described how some Akron children enter kindergarten not only unable to read, but not knowing the alphabet or primary colors. When they reach third grade, the district steers about 200 low-performing students — about 12 percent of the entire grade — into James’ program. So far, the foundation hasn’t specified what students must do to qualify for the college scholarships except to say it will require some community service. Until five years ago, UA had an open admissions policy, meaning anyone could attend. Then it began requiring a minimum ACT score of 16, which is in the 24th percentile of all students taking the test, according to 2014 figures. The average 2014 ACT score for Akron Public Schools students was 17.9. Since James is working with the kids who are the furthest behind, a 16 on their ACTs is a big number. 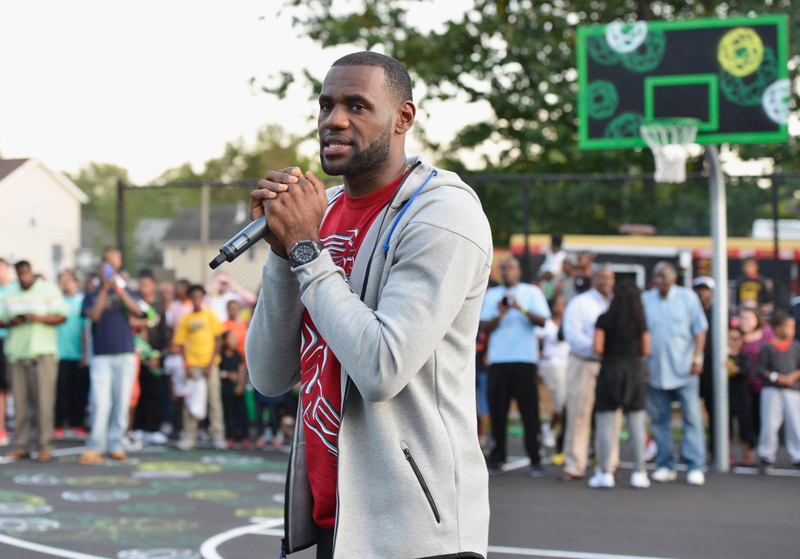 Photo by Duane Prokop/Getty Images for SpriteLeBron James joined Sprite to reveal two refurbished outdoor basketball courts with painted artwork by Futura at Patterson Park on September 25, 2014 in Akron, Ohio. For academic help, James’ program relies almost entirely on the district’s after-school tutoring program, which runs two hours per day, four days per week. From 30 minutes to an hour of that time is spent on academics, depending on grade level; the rest is fun activities. After the program lost a third of its funding, some of James’ students were unable to participate. His foundation has secured a contribution from a corporate partner to ensure that all of the I PROMISE kids get tutoring. Representatives from James’ foundation and the Akron school district declined to provide any data on the academic progress of students in the I PROMISE program, the oldest of who are now in seventh grade. They also declined to share a report on the program that was submitted to the foundation in February by researchers from the University of Akron and its newly named LeBron James Family Foundation School of Education. But public data show little, if any, progress in reading scores for all Akron Public School students now in the seventh grade. Fast-forward four years, to 2014-2015, the most recent year for which statistics are available, when James’ first class of kids was in the sixth grade. Of all Akron sixth-graders that year, 37.6 percent did not score “proficient” on the reading test. That included 25.7 percent who scored “basic” and 11.9 percent “limited,” which may indicate slight improvement among some of the most struggling students. Michele Campbell, chief operating officer of James’ LRMR Management Co. and the person in charge of his foundation, said the February report showed some improvement in test scores, but the children are still behind their peer group. The foundation is working with the university to identify and implement needed changes, she said. “I was a little bit bummed that our children aren’t caught up. Then I refocused on how can they catch up,” Campbell said. Dr. Robert Balfanz, who has studied high-poverty schools for 20 years as director of the Everyone Graduates Center at Johns Hopkins University, said James’ program could use more focused academic interventions during the regular school day. Research has shown that out-of-school activities are helpful, he said. But it must be combined with changes to the curriculum, better training for teachers, and one-on-one monitoring of students’ attendance and participation. 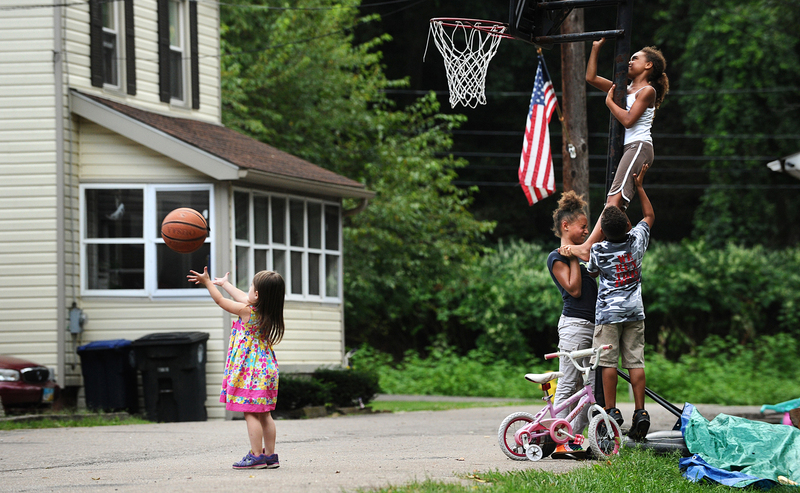 Photo by Wally Skalij/Los Angeles Times via Getty ImagesChildren team up to adjust the basketball rim near the former childhood home of LeBron James on Overlook Place in Akron, Ohio. In the 2015 Finals, James had more points, rebounds and assists than any other player — and the Cavs still lost in six games. In Akron, all his phone calls, messages, trips, summer cookouts and free goodies won’t succeed without teachers, administrators, parents and students raising their games in unison. It’s a much larger task than Frankie and Pam Walker providing focus and discipline for one lost schoolboy. James is 31 years old now, with flecks of gray visible in his beard, no longer the unanimous choice for best player in the world. For the first time in his basketball life, there is a slight sense of the underdog about him. This season has been bumpy. An anti-inflammatory injection in his lower back sidelined him for most of the preseason. Chemistry issues festered with fellow Cavaliers Kevin Love and Kyrie Irving. In January, the defending champion Warriors dealt the Cavs an embarrassing 34-point home loss. Head coach David Blatt got fired soon after, and some thought James swung the ax. Then James’ jumper deserted him. He has shot a brickish 31 percent on 3-pointers this season, his lowest percentage since his rookie year and a steep drop from 40 percent during his 2012-13 MVP season. Yet young stars in their actual 20s are vying for King James’ basketball throne. Oklahoma’s Russell Westbrook is more explosive, his teammate Kevin Durant a purer scorer, the Spurs’ Kawhi Leonard a tougher two-way player. The prince Steph Curry just grabbed his second straight MVP, which James did in 2012 and 2013. But Curry was the unanimous choice this year, something James never achieved. And Curry’s Warriors look like a budding dynasty, while James’ Cavs, despite sweeping their first two playoff series in the weak Eastern Conference, have yet to consistently coalesce. James may not have promised Cleveland a title, but history will judge him harshly if he doesn’t deliver, and his championship window is slowly but inexorably closing. Unlike basketball, however, education is not a zero-sum game. Basketball is defined by measurements, from height to assists to rings. How to measure James’ assists for Akron? Five years in, has his program really uplifted the city’s poorest kids? Magee isn’t quite as effusive. “I don’t see no immediate difference, not a big difference,” she said at the community meeting. An earlier version of this story gave the wrong date for the Cavaliers 34-point home loss to the Warriors. That game took place in January, not December.